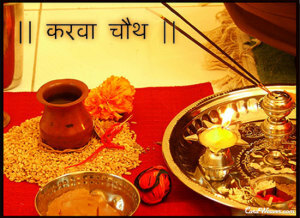 Karva Chauth (Hindi: करवा चौथ) is a one-day festival celebrated by Hindu women in North India in which married women fast from sunrise to moon-rise for the safety and longevity of their husbands. The fast is observed in the states of Uttarakhand, Uttar Pradesh, western Bihar, Himachal Pradesh, Jammu and Kashmir, Haryana, Punjab, Rajasthan, Chhattisgarh, Madhya Pradesh, Jharkhand and Gujarat. The festival falls on the fourth day after the full moon, in the Hindu lunisolar calendar month of Kartik. Sometimes, unmarried women observe the fast for their fiances or desired husbands. 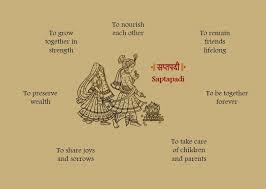 In modern North Indian society, Karva Chauth is considered to be a romantic festival, symbolizing the love between a husband and wife. It has been celebrated in Bollywood movies such as Dilwale Dulhania Le Jayenge, where an unmarried woman signals her love for a man by keeping the fast for him and he reciprocates by secretly fasting as a gesture of empathy, as well as demonstrating his concern for her during the day and breaking her fast by feeding her at moonrise, and Baghban, in which a man persuades his elderly fasting wife to break her fast over the telephone because they have been separated by their uncaring children. News coverage of celebrities sometimes highlights the keeping of the fast by an unmarried public figure because it indicates a strong and likely permanent romantic attachment. Similar to Valentine’s Day, the lack of a romantic partner can acutely be felt by unattached women.] The festival is used extensively in advertising campaigns in the region, for instance in a Chevrolet TV spot in which a man demonstrates his caring for his wife by buying a car with a sunroof so he can drive her around on Karva Chauth night until she spots the moon through it. Since Karva Chauth is celebrated primarily by women (men are entirely excluded from the festival’s observances until moonrise, though they are expected to demonstrate attention and concern for their fasting wives) and because beauty rituals and dressing-up are a significant part of the day, the festival is seen as an event that bonds women together. In the present day, groups of unmarried women sometimes keep the fast out of a sense of friendship, though this practice is far from universal. This is especially true in the urban areas of North India and is interpreted as a prayer for a loving husband in the future. 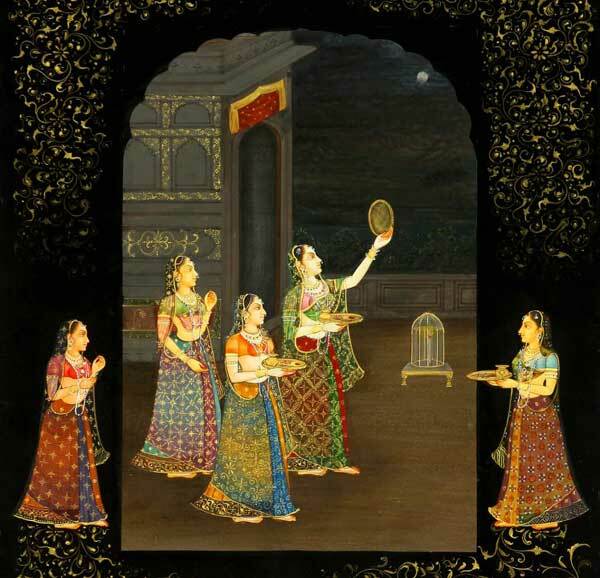 Another trend in the northern urban areas is the spreading of the festival’s observance to women originating in communities and regions (such as Bengal and Maharashtra) that have not traditionally celebrated Karva Chauth or even been aware of the festival’s existence. The festival has been criticized as being inherently sexist by some because there is no reciprocal fasting by males and called uplifting for women by others. There have been calls to modify or eliminate the festival by commentators who hold it to be “anti-women” and to “perpetuate the notion of women’s dependence on men.